It is well established that partial nephrectomy is the recommended surgical management for localized T1a renal masses. Partial nephrectomy is also favored over radical nephrectomy in patients with T1b tumors when technically feasible. The robotic platform could directly contribute to the increasing usage of PN for the management of renal masses. Meta-analyses have shown that robot-assisted partial nephrectomy provides better peri-operative outcomes than laparoscopic and open partial nephrectomy. It is foreseeable that usage of robot-assisted partial nephrectomy will continue to increase and may become the standard option for the management of small renal masses. 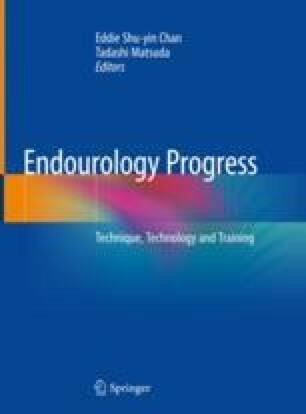 In this chapter, surgical procedures of robot-assisted partial nephrectomy, advantages of robot-assisted surgery in nephron-sparing surgery, balancing functional and oncological outcomes during robot-assisted partial nephrectomy, anatomical aspects regarding partial nephrectomy, learning curve for robot-assisted partial nephrectomy, indications of nephron-sparing surgery and nephron-sparing surgery for high complexity tumors has been described.